We are proud to offer the highest quality in envelopes & pockets through state-of-the-art German technology and high quality raw materials, imported exclusively from Europe by. • State-of-the –art german made envelope manufacturing machinery and spare parts, applicating the most up to date technology in production. • High quality envelope paper in all our products, imported from Finland. • Specialty adhesives for envelopes imported from Germany. • High quality non-reflecting window material imported from Belguim. • High quality siliconized paper for peel&seal application (self adhesive envelopes) imported from Italy. • High quality boxes to ensure safe packing and stacking of the envelopes. CIB, NSGB, HSBC, AAIB, BNP Paribas, Barclays Bank, Credit Agricole, Faisal Islamic Bank, Bank of Alexandria, NBE, AIB, Arab Bank, Citi Bank, Piraeus Bank, National Bank of Abu Dhabi, ABC Bank, Diners Club, Vodafone, Mobinil, Etisalat, CIL, Bibliotheca Alexandrina, Ministry of Finance, Egypt Post, Bank Misr, Telecom Egypt, Orange Business services, InterBuild Exhibition, Techno Print Exhibition. We are also specialized in high performance "auto mailer" envelopes for automatic inserting machines. We are proud to be the leading producer of mechanical envelopes in Egypt. 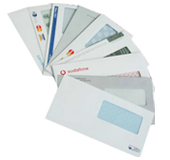 We offer envelopes and pockets in all shapes and sizes (C6, CD, GS, DL, C6/5, C5, B5, C4, B4), both gummed and peal & seal.